Sri Lanka produced a near flawless performance in Dharamsala and captain Thisara Perera is expecting an encore from his team in the second ODI to win a maiden series in India. "It is a good opportunity to win the series. Not many teams have won series in India. We want to do something special, like we did in Dharamsala," Perera said on the eve of the second match of the three-ODI series. Adverse weather conditions in Dharamsala meant Sri Lanka had to spend an extra night in the hills and only arrived in Mohali on Tuesday morning. They arrived at the PCA Stadium late afternoon and practiced amid cold and overcast conditions. Asked if there is an added pressure on the Sri Lankan team, Perera replied in the negative. "It is not pressure. It is another game for us. Everyone knows if we win tomorrow we will win the series. We will give our 200 per cent," the all-rounder said before hinting that they would go with the same XI that beat India by seven wickets in the series opener. The visitors are a confident lot, having ended their 12- match losing run in Dharamsala but they expect India to come back harder, just like they did against New Zealand last month after losing the opening game of the three-match series. "Yes they can but we are focused on our job. It was good to win after 12 losses and we know if we can repeat that performance, we will win tomorrow," said Perera. The Sri Lankan captain has the experience of playing at this ground, having represented Kings XI Punjab in the Indian Premier League. "It looks like a good batting track," he said referring to the surface, which was covered for major part of the day due to overnight rain. 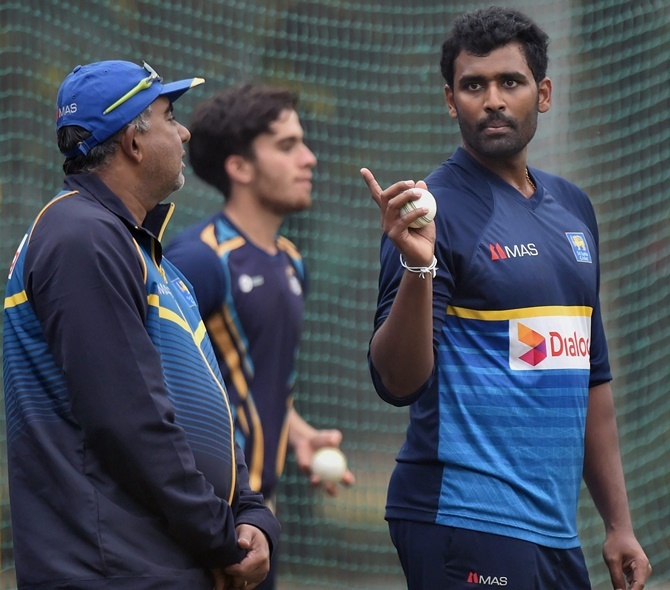 Talking about the squad, Perera said only Dhananjaya de Silva has fitness issues. "Only he is not fit out of the 15," said the skipper. Asked about India not playing Ajinkya Rahane in Dharamsala on a pacer-friendly track, he said: "I am not an Indian selector, so I can't say why he did not play. Obviously he is a good batsman. I can't say anything more than that." PHOTOS: Virat Kohli and Anushka Sharma married! It's his birthday! Yuvraj Singh turns 36!